In the office of the smart-clock arrived without packaging, but we know the equipment of the device. 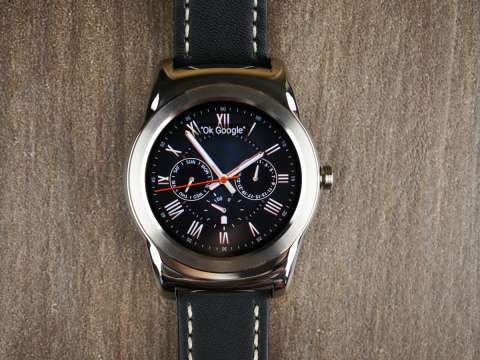 It does not differ in abundance, but it has everything you need - the LG Watch Urbane watch with a leather strap, a round charging cradle, an adapter with a current of 0.85 A, a micro-USB cable and a quick user's guide. 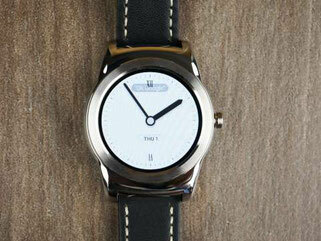 It is difficult to describe the appearance of a smart clock if they look like ordinary watches. 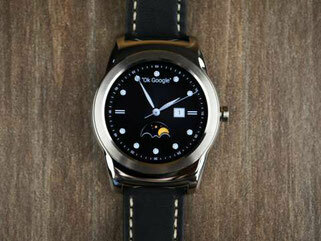 Stainless steel case, sewn leather strap. The case is available in two colors - "pink gold" or "silver"
In short, Watch Urbane is easy to take for a classic device. This is facilitated by a round display and a button on the right, made in the style of a crown. A round and fairly thick frame of polished metal around the screen adds austerity design. Above and below are massive ears. At the bottom clearly visible microphone openings. On the back there is a heart rate sensor, as well as contacts for receiving power from the cradle. Cradle is equipped with a magnet. Also in the plastic on the right is a notch for the crown-button. The appearance of the device is minimalistic and strict. 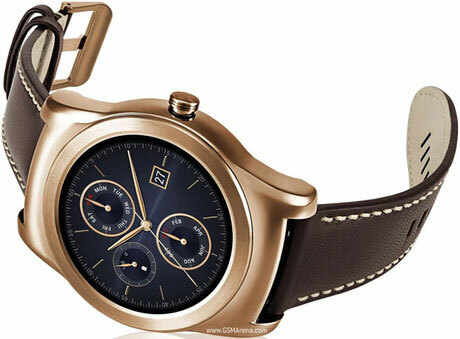 However, LG Watch Urbane is also very massive, so not on any hand will look organic. 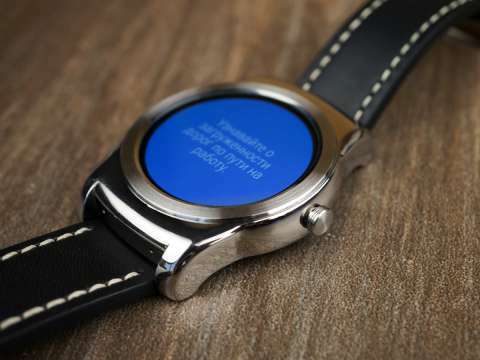 In LG Watch Urbane is a round plastic OLED display (P-OLED) with a diameter of 1.3 inches (33 mm), a resolution of 320 by 320 pixels and a density of 245 ppi. The display is quite high-quality, but there are small distortions around the edges - the round shape of the screen affects. Thanks to the OLED-matrix, black color is natural. Pleasing and viewing angles, which is important for such devices. But the main color rendition can not be called exemplary. The palette could be brighter and juicier. Another drawback is the lack of readability in the sun. There is no automatic adjustment, and to see the time in the daytime, even at maximum brightness, you have to cover the screen with your hand. 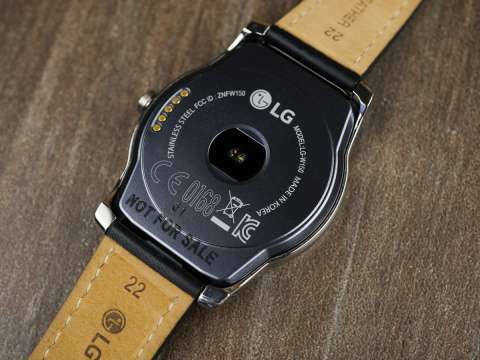 Inside, the LG Watch Urbane has a quad-core Qualcomm Snapdragon 400 processor with a clock speed of 1.2 GHz and an Adreno graphics accelerator 305, 512 MB of RAM and 4 GB of internal memory. Unfortunately, the possibilities for using the internal space are limited. It is available for installing applications and dials, as well as downloading music from Google Play to the device's memory and then listening to it with a Bluetooth-enabled headset. 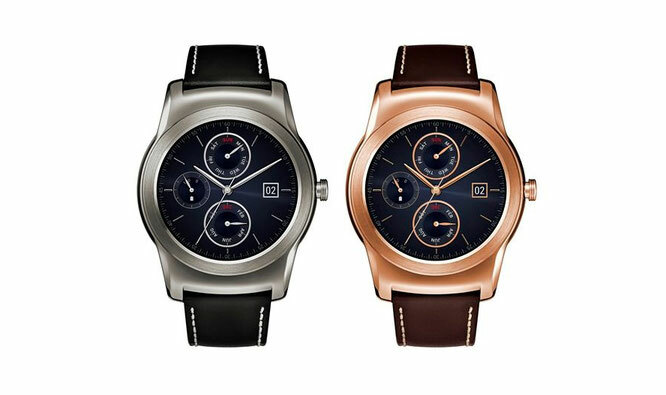 LG Watch Urbane is equipped with Wi-Fi modules in the version 802.11 a / b / g / n and Bluetooth 4.1 LE. Both worked clearly, without censure. 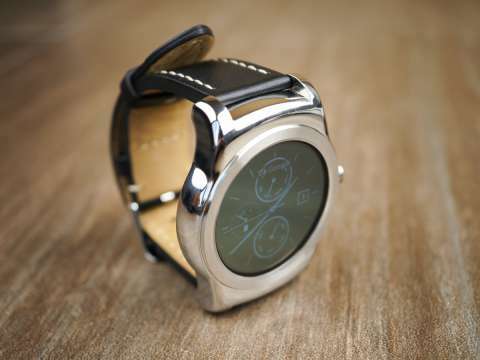 The LG Watch Urbane has a non-removable 410 mAh battery. The battery capacity did not increase in comparison with LG G Watch. With maximum brightness and when the display is off (in standby), the smart clock is discharged to zero in about 30 hours. The same 30 hours they lived at medium brightness and always active display. And since the clock is charged only through the cradle, it is better to put them there every night than to carry around with an extra device. Charge the clock from 0 to 100 percent with a current strength of 0.85 A for 40-45 minutes.